"Truly leading-edge technologies are always brought to us through the hands of people." What do Shinkansen trains and cellos have in common? 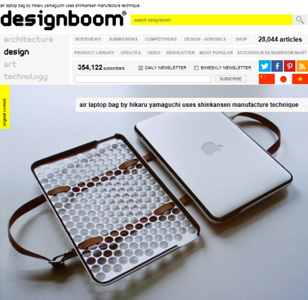 designboom "air laptop bag by hikaru yamaguchi uses shinkansen manufacture technique"
High Resolution JPG file download of the pictures above can be done by a single click. 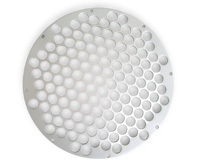 Inspired by beautiful "Seimitsu" precision parts supplied for Intel MPU manufacturing equipment, the aluminum cases are designed. Elegant curves are made by a highly skilled craftsman (recipient of the Medal with a Yellow Ribbon for industriousness), using special technique called "Uchidashi". 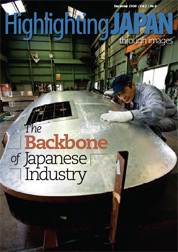 In Japan, "Uchidashi" has been understood as one of the best suited techniques to form 3 dimensional sheet metal objects, especially for small quantity production as in the case of the nose cone of Shinkansen bullet trains. Yamashita Kogyosho is recognised as the pioneer of Shinkansen face production by "Uchidashi", and is a Special Prize recipient of the Monodzukuri Nippon Grand Award. 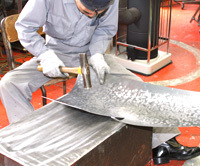 This hand-hammering craftsmanship has contributed greatly to the production of an elegant streamline “face” of the Shinkansen. Kiyoto Yamashita, the founder (recipient of the Order of the Rising Sun, Gold and Silver Rays), was a self-employed "Uchidashi" craftsman working at Hitachi Kasado Works. 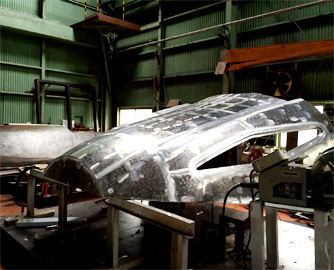 He led a team of craftsmen to produce the face of the first Shinkansen test car that was completed in 1962 (March 1963, the test car recorded 256 km/h, the high speed world record at that time). In September 1963, almost one year before the launch of Shinkansen services, Yamashita Kogyosho was founded as supplier for Hitachi to produce Shinkansen faces. Since then, the company has supplied faces of almost all major series of Shinkansen including the latest E5, E6 and E7 series of JR East. Also faces of intercity express trains, monorail cars and magnetic levitation test cars in Japan have been produced by the craftsmen team. In addition to the face, the company has been supplying various types of streamline shaped train parts for use at driver's cabin and multi-purpose room. 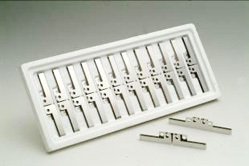 In 1984, based on experience of train parts production, especially of the train driver’s desks, Yamashita Kogyosho started production of sheet metal precision parts for Hitachi and its group companies. In the last 30 years, the production of precision parts, "Seimitsu" parts in Japanese, has grown in accordance with the business expansion of the current Hitachi High-Technologies. 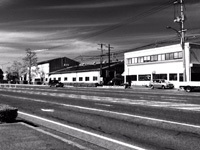 Nearly half of current sales of Yamashita Kogyosho have been generated from the "Seimitsu" parts production for Hitachi's semiconductor manufacturing equipment for Intel and TSMC. 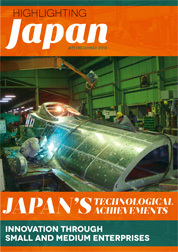 Yamashita Kogyosho is recognised by METI as one of the Japan's 300 Exciting Monozukuri (Manufacturing) SMEs. The current biggest shareholder is SBIC West Japan, which is one of the first venture capital firms in Japan. The company is situated in the city of Kudamatsu in Yamaguchi-Prefecture, which is the most western part of the Japanese main Island (approx. 1,000 kilometers west of Tokyo). For more information, please contact us via email info@odeko.co.jp. 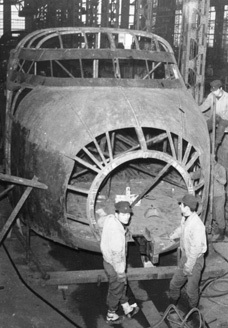 It is hard to imagine that a simple hammer can shape the complex curves of this high-tech train's nose. What is even more remarkable is that only one company in Japan, with a mere 40 employees, has employed this technique to produce many of the Shinkansen's distinctive shapes. Demonstrating Domestic Skills: Yumi Katsura Pearl Dress and More at "The World's Best from Japan"
'Hammer work is very deep. 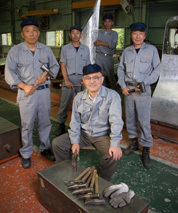 The more I do it, the more I learn about it' Jiro Kunimura, Building the world's fastest trains with hammers. The Shinkansen, or "bullet train" as it is known overseas, is the super express train that made Japan's railway technology known to the world when it debuted in 1964. One of its most distinctive features is the elongated "forehead" at the front of all the main models, many of which were produced by artisans working for the same company. 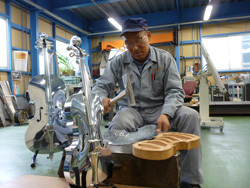 Yamashita Kogyosho Co., Ltd. is a small urban factory in Kudamatsu City, an industrial city in Yamaguchi Prefecture. 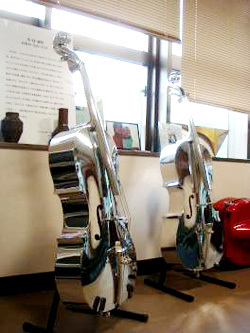 The first aluminum cello, Madoka (right). 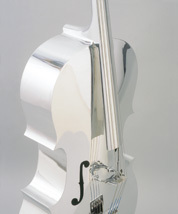 Since 2008, aluminum string instruments have been fabricated in order to show craftsmanship that makes delicate and elegant curves on metal sheet. The instruments have been exhibited and played at various events, exhibitions and ceremonies. 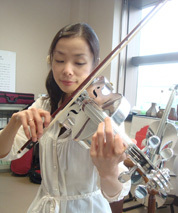 Until May 6, 2014, one of the violins is exhibited at the National Museum of Emerging Science and Innovation (Miraikan) in Tokyo. THE SEKAI-ICHI, Unique Inspirations "Made in Japan"